An extensive patch made it to the live client on March 19th. In order to avoid old and obsolete statistics, the data displayed in this article has been gathered starting from March 20th. The new hero Baptiste is not included because he is still not available in competitive play. Blizzard has not released an Overwatch API to access the data of all players in the game, so this article displays no official info. There are several websites that gather data from their users, and I decided to utilize the statistics provided by Overbuff as it is the most popular one. Jeff Kaplan shared the official data on season 9, and the figures were mostly similar to the ones available on Overbuff. We can trust the data even it is isn’t completely accurate. The table is responsive. If you are using a phone, turn it sideways for a full view. Otherwise, zoom in or click the grey area to swipe the table. The following graph shows the hero pick rate considering all ranks. Symmetra is still included among the supports because of the statistical tool used. Removing her would have caused problems with the data. The graph shows data on the top 8 most picked DPS heroes at all ranks. Hammond: the next meta tank? The last patch affected over a half of the hero roster (19 out of 30). The Overwatch developers are trying their best to get rid of the triple-tank meta, and I think we will witness the first lineup changes in the next stage of the Overwatch League (GOATS won’t be so dominant anymore, but it won’t disappear). This month, we have about one week of data available to define our ranks: the situation will keep evolving, and only at the end of April we will have an accurate idea of the meta played during season 15. After comparing the top heroes at Master and GrandMaster in February and March, we can notice the rise of Wrecking Ball. I believe his pick rate will increase and he will earn a place in the next meta, so in this analysis I decided to provide info and tips on his gameplay. The last patch buffed Hammond’s Adaptive Shield as it no longer cancels Roll mode. It might look as a minor change, but it is one of the biggest hero buffs in the entire patch. Before, Piledriver was a lot riskier because utilizing this ability without a very-coordinated team often resulted in your death. After a successful Piledriver, you are forced to activate Adaptive Shield for survivability, but this action sacrificed your mobility, so you became an easy target to focus and eliminate. Now, the risk completely disappeared, which made Hammond a more reliable pick even in a pub environment. You can play the hero more aggressively and finally act as a “real tank”. Adaptive Shield and Piledriver have a similar cooldown (15 and 10 seconds respectively), so I suggest slamming the opponents only when your defensive ability is available. Using this combo, only teams with reliable crowd control can kill you because Hammond is both tanky and mobile while in Ball form. Hammond is a very mechanically intensive hero, so expect a lot of training to master him. Your primary job is to disrupt the enemy formation and cause confusion among the opponents, which in turn will create space and opportunities for your team. Hammond can stall the point, contest the high ground, push enemies through a choke towards his own team, and in particular he excels at harassing the back line. One of the most difficult choices for a Wrecking Ball player (and any dive hero) is understanding who to engage. There is not a perfect answer because it depends on several factors, such as the conformation of the map, the lineups, the placement of DPS, supports, and tanks on a particular point or choke. It is only mandatory to avoid areas where there are enemies with crowd control abilities (like Ana’s Sleep Dart) because they hard counter you by disabling your mobility. Squishy heroes are among the easiest targets, and isolating supports in particular is one of the best options because they won’t be able to heal their tanks. Alternatively, using Piledriver on the main tank also brings great benefits because their team will be suddenly defenseless (especially if you slam a shield-based tank), and your DPS heroes will have a free line of sight against supports and squishy heroes. In any case, as one of the most mobile heroes in the game, it is mandatory to follow the plans of the team and react quickly if they need your intervention anywhere else as you can relocate quickly from a place to another of the map. Do not try to get a kill as a solo Wrecking Ball versus a full-HP opponent. You lack the damage to defeat them 1vs1 (against a decent player), and your hero is extremely vulnerable when not in Ball mode. Your survivability is of primary importance for the goals of the team. You should limit your actions to harassments most of the times; but this doesn’t mean you can’t actually kill heroes. Listen to your DPS teammates, and as soon as they call that a target is low HP, you can jump there quickly and finish them. Wrecking Ball and Winston have pretty much the same purpose in the team: they have to treat the back line and disrupt the enemy formation. 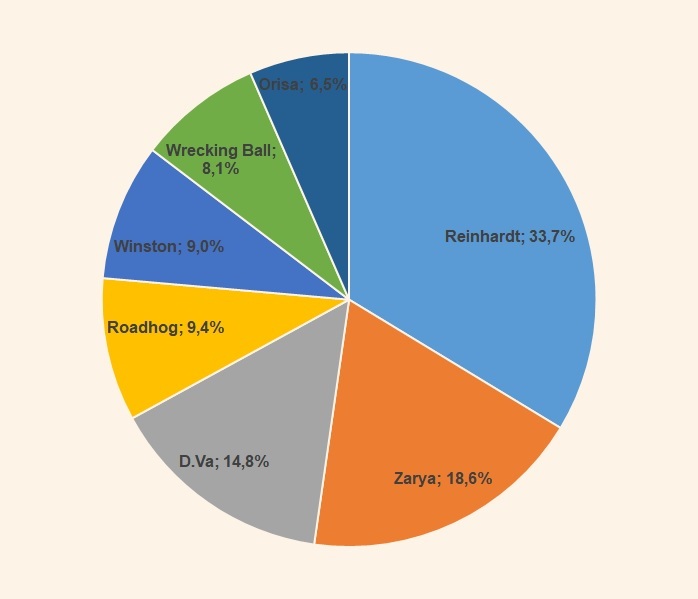 Winston is considered a better pick in most scenarios, but Hammond is a lot less reliant on heals than him thanks to Adaptive Shield. Also, Hammond’s mobility is so amazing that in many maps he is able to heal himself by reaching the health packs quickly. This is of great help at most ranks because the main healer will have more free time to keep the squishier members of the team alive. Hammond can engage and get out alive from almost any situation, unless the opponents have a huge amount of crowd control (Winston can do the same, but Hammond has more mobility). He is probably one of the tanks with the highest solo-survivability in Overwatch, after Roadhog. For Wrecking Ball, communication is exponentially more important than any other skill. You must communicate with your team as much as possible and alert them when and whom you are going to dive (before actually doing it). It is hard to predict where a Hammond is going to attack because his entire playstyle is based on constantly engaging and disengaging the fight, and thanks to his mobility he can reach any point of the map in no time. If your Widowmaker is going to headshot an opponent, and suddenly you slam them out of nowhere, there will be flame and problems inside the team! Many players just deploy Minefield in the middle of the battle, but this isn’t the best way to place it. Minefield is a great zoning tool. You want to give your team a positional advantage by securing as much space as possible, so you must spread out your mines on the battlefield. Swing high above the enemy team, activate your ultimate at almost the maximum height, and then use Piledrivers to lock some enemies in place: they won’t have the time to run away while your mines are activating. The Overwatch Ranked Tier List indicates the most popular heroes during season 11. Find out the most successful heroes in this meta depending on your rank.